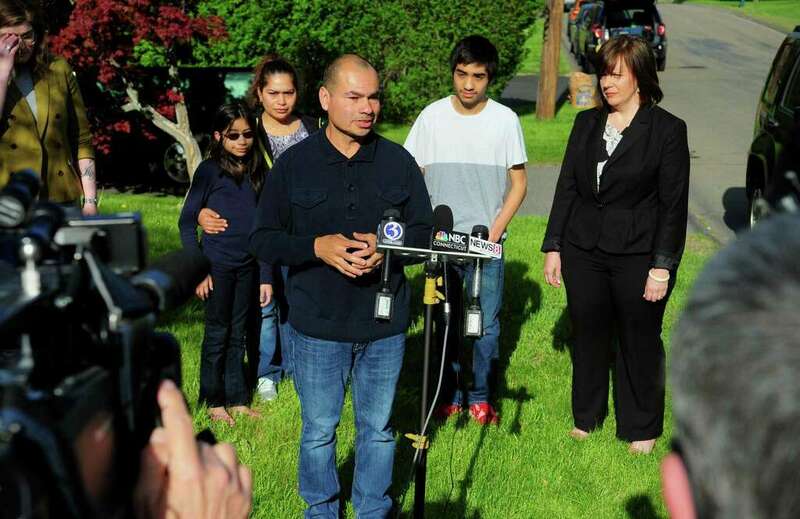 A Farmington couple scheduled to be deported Friday was granted a stay of deportation Thursday afternoon, Gov. Dannel P. Malloy’s office said. Huang and Li are Korean by ethnicity and Chinese by nationality. Huang entered the country illegally in 1999, while Li followed legally in 2000, according to Erin O’Neil-Baker, the attorney representing the family. O’Neil-Baker said at the Thursday press conference that Huang and Li could face persecution for their ethnicity and religion if returned to China, as well as the length of time they have lived in the United States, which could be constituted as a political opinion for which they could be persecuted. Forget the criminal record, simply defying a deportation order in the past or any other mandate from immigration, no matter how long ago, can lead to a directive to leave the country. “They want to be here legally. They want to pay taxes. They want to give back,” said O’Neil-Baker. She says her clients, many with little money, have fled war-torn countries or life-threatening situations and are trying to buy time here in the U.S., hoping the process of becoming a legal resident or citizen would eventually get easier. The federal Board of Immigration Appeals has agreed to reopen the case of Luis Barrios, an undocumented father of four from Derby with no criminal record who faced deportation last month. An attorney for Barrios petitioned the board to take another look at his case, saying he feared for his life if he returned to his native Guatemala, where he fled from in 1992. Several members of his wife's family have been murdered in the South American country in recent years, according to Barrios' motion to reopen the case. Erin O'Neil-Baker, an attorney with Hartford Legal Group, said three previous petitions she filed to re-open Barrios' case had been denied. By granting the fourth motion, which she also filed, a deportation order for Barrios will be wiped clean and he'll appear before an immigration judge in Hartford. "All of that pressure that he's been facing is now gone," she said. "It's really a huge relief for him. He now gets to pursue a claim for protection here in the U.S."
A Derby man who is undocumented and had been scheduled for deportation to his native Guatemala will be allowed to stay in the United States for two more years. Barrios' lawyer, Erin O'Neil-Baker, attributed the federal decision to grant a temporary stay of the deportation order to community pressure and appeals from Connecticut's congressional delegation. O'Neil-Baker thanked U.S. Sen. Richard Blumenthal, D-Conn., who was at the news conference with Barrios, for his "extreme efforts" to help get the deportation reprieve approved. O'Neil-Baker said the two-year reprieve will give Barrios a chance to once again apply for U.S. sanctuary and take advantage of all his legal options. Blumenthal called the Barrios case "exceptional" but added there are other undocumented immigrants in Connecticut who are facing deportation despite having no serious criminal record. "Mr. Barrios isn't alone in this struggle," O'Neil-Baker said. Luis Barrios, an undocumented father of four from Derby, has been granted a 30-day reprieve on a deportation order that would have forced him to leave the country Thursday morning and return to Guatemala. A tearful Barrios expressed his gratitude to supporters at a news conference at 5 p.m. Wednesday in front of his two-story home on a quiet street, saying, "I would like to say thank you everybody for supporting me ... God bless you everyone." Surrounded by family members who also wiped tears from their eyes, Barrios, who fled Guatemala for safety 24 years ago and is a sanitation worker, said that his family has tried to demonstrate "that we are a good family" with the desire to be "good citizens over here." His lawyer, Erin O'Neil-Baker, said, "We are extremely grateful for everybody's efforts and the family is overwhelmed with joy for this small reprieve." O'Neil-Baker said the next step for her client, who would have been on a 4 a.m. flight Thursday bound for Guatemala, will be to pursue a motion pending with the Board of Immigration Appeals to reopen the order for Barrios' removal. "We hope we can work with Immigration and the Department of Homeland Security and ICE to find a resolution here and possibly, hopefully give Mr. Barrios an opportunity to actually hear the merits of his case." She said the hope is to find a "permanent solution." 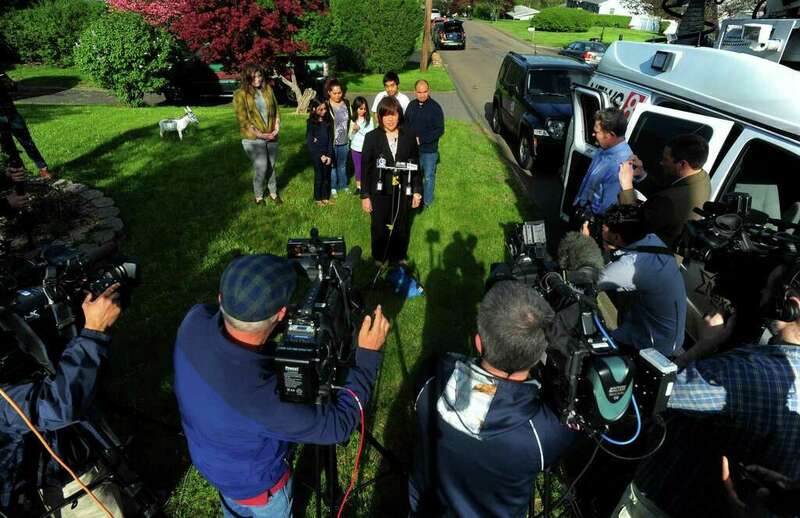 A PRESS CONFERENCE IS HELD BY LUIS BARRIOS' IMMIGRATION ATTORNEY ERIN O'NEIL-BAKER, AT HIS HOME ON CHESTNUT DRIVE IN DERBY, CONN., ON WEDNESDAY, MAY 3, 2017. BARRIOS, A NATIVE FROM GUATEMALA, HAS LIVED IN THE US FOR 25 YEARS, AND WAS WAS JUST TWO DAYS AWAY FROM BEING DEPORTED. BARRIOS HAS BEEN GRANTED A 30-DAY STAY WITH HELP FROM U.S. SEN. CHRIS MURPHY, U.S. SEN. RICHARD BLUMENTHAL AND U.S. REP. ROSA DELAURO. Attorney Erin I. O'Neil-Baker is honored in the Hartford Business Journal, "Women in Business" 2014 edition, as a remarkable woman who is making a difference in the community. The article recounts Attorney O'Neil-Baker's history and commitment to both her clients and family and discusses her long history representing immigrants and fighting for new immigration law. Attorney O'Neil-Baker is described in the article as: "very effective in representing immigrants and pushing the agencies that work on these cases in a timely and fair way." Hartford Legal Group was the 2013 top sponsor for the International Institute of Connecticut's (IICONN) first annual banquet. IICONN is a non-profit, non-sectarian social service agency dedicated to helping thousands of foreign-born persons and immigrants each year to achieve self-sufficiency. "Congress is on the precipice of enacting comprehensive immigration reform, but a recent policy change by the Department of Homeland Security (DHS) is allowing a limited number of undocumented immigrants to access their own path to legal permanent residency and U.S. citizenship now...."
If you are not subscribed to the CT Tribune contact Erin@hartfordlegalgroup.com for a full copy!